I was able to get over to this years Fashion For Life, the annual event that raises donations for Relay for Life. This is a 9 sim event, so you will need to make sure you have plenty of time, or spread the event out over as many days. It starts today, and the celebrators and organisers look to be already having a fun time over on one of the adjoining sims. 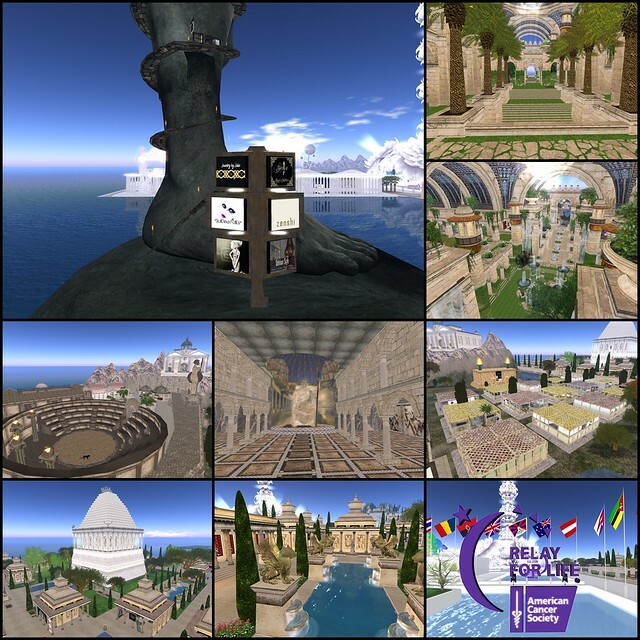 This year they have combined the works of many of SL’s artists, such as Bryn Oh, with the building of this event, so each build seems to have been done by a separate creator. Also as you can see, there is definitely a theme running throughout, and as someone who has spent a lot of time in games lately, it was kind of mixed reality for me…I kept imagining I was supposed to hand in a quest to someone. I remember the first ever Fashion for Life, and I had done a post on how they had no railings along their molten lava pools, so I kept falling in, and the very next day I got an IM from the organiser and they had put some in. This made me of course wonder about the incredibly large statue build on one of the sims, that actually houses some stores. 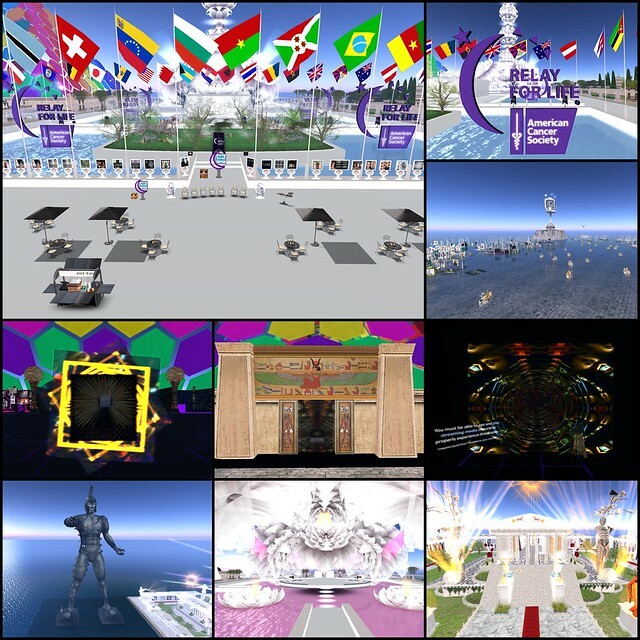 The statue is amazing, and so tall, and I just love the idea of it, but for an event that is going to generate hundreds of visitors at once, with lag and the such, I do think that it might be more of a cam from the ground experience for some…there are also no safety rails, and I tend to scream in RL when I fall in SL. I also get motion sick and all that winding around, I would be done in for sure. I do wish I had gotten to spend more time over there, but I did want to get pics done and get this post up. I am sure I will end up visiting again, because I am really more intrigued by the nooks and crannys of everything, wanting to see actual set ups, and of course visit the stores, as that is what the event is for. The event organising has been done by a different group this year, Frolic Mills and his team have been working day and night, and posting notices to keep everyone aware of everything for weeks now, so I do hope they get some time to enjoy the event once it is open. Congratulations to all that are participating in Fashion For Life, it is a huge undertaking each year to co-ordinate, I look forward to seeing more about it. FASHION FOR LIFE 2013 | WHO, WHAT, WHERE?